Very wet February at Amazing Grace Food Pantry, but volunteers still served 24% more families compared to February 2017. Overall, 290 families visited weekly to receive a total of 46,000 lbs of food. Volunteers carried out 1090 boxes! Go Team!! New Building Update: Prior to being granted a Certificate of Occupancy, the parking lot entrances need to be widened and a fire lane must be designated with paint striping. Landscaping, while not required by code, also needs to be done to repair the damage done by construction. Call to Action: If you or someone you know does culvert, asphalt or concrete work, please contact us ASAP by calling 972-292-7241 to leave a voicemail message. You can also help us reach the funding goal for this required aspect of the project by visiting our Donate page. Clients and volunteers are anxious to move into the new building, but until the parking lot work is done, we can’t open the doors. See pictures of the current parking lot in our Facebook album Parking Lot – February 2018. 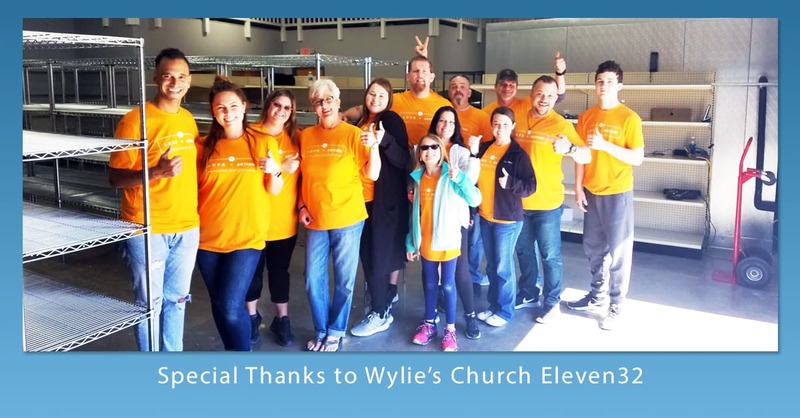 Special thanks to Wylie’s Church Eleven32 for their hard work assembling the warehouse shelving. They are on fire for Jesus and want to serve the community… they fit in perfectly!